Hudson – Norman A. Swanfeldt, 83, of Hudson, passed away peacefully Friday, June 1, 2018, at Marlborough Hospital. He is reunited with his beloved wife of 57 years, Rosalie (McAllister) Swanfeldt. Norman was born in Medford, the son of the late Tyko and Evelyn (Norman) Swanfeldt. He was raised in Somerville, and after graduating from high school he proudly served his Nation in the United States Marine Corps from 1953 – 1956. Upon his return from active duty, Norman married the love of his life, Rosalie, and together they settled in Hudson in 1966, where they had resided since. He worked as a purchasing agent for the Honeywell Bull Corp. for many years before he eventually retired. Norman was very proud to be a Marine and always kept in touch with his former shipmates from the U.S.S. Newport News throughout the years. He was also an avid gardener and he took meticulous care of his lawn and yard. Norman was also a diehard New England Patriots fan. 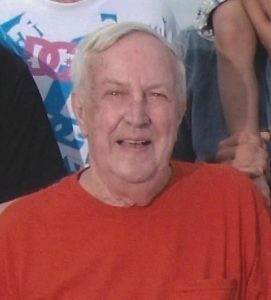 Norman is survived by his five children, John Swanfeldt and his girlfriend Tiffany, both of Marlborough, Stephen Swanfeldt and his wife Laurie of Hudson, Wendy Mousette and her husband John of Barrington, N.H., Richard Swanfeldt and his wife Kelly of Marlborough, and Sandy Swanfeldt of Hudson; his grandchildren, Jonathan Mousette, Thomas Swanfeldt, Bradley Mousette, Kylie Swanfeldt, Lydia Beatty and Julia Beatty; his great-grandson, Hunter Swanfeldt; and his two brothers, John Swanfeldt and Roy Swanfeldt. In addition to his wife and parents, he was also predeceased by his grandson, Eric Swanfeldt. Relatives and friends are invited to a period of calling hours Wednesday, June 6, from 4-7 p.m., at TIGHE HAMILTON REGIONAL FUNERAL HOME, 50 Central St., Hudson. A funeral service will be held the following day, Thursday June 7, at 11 a.m., in the funeral home. Burial will be private at a later time.